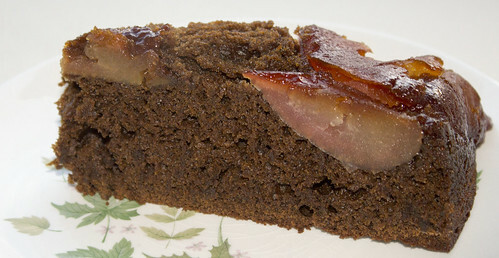 This cake is a gingerbread Tarte Tatin with apples. I baked it in my 10" cast-iron frying pan. 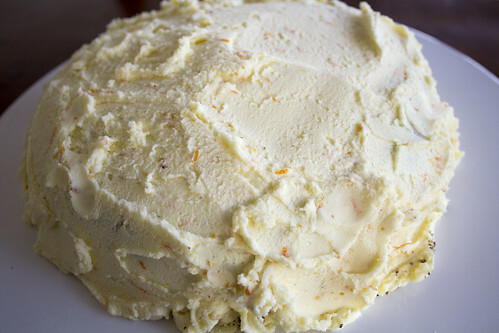 Don't be put off by the number of ingredients or steps, it's pretty easy to make. Melt butter in an oven-proof pan. Set aside to cool while preparing next stage. Mix molasses, egg, ginger, and ¼ cup sugar in a large bowl. Add in sour cream, followed by the milk, mixing well. Sift flour, salt, cinnamon, baking soda, and baking powder. Gradually add dry ingredients to molasses mixture. Add in 3 tablespoons of the melted butter from step 1, then set aside. Prepare apples by cutting into 3 large pieces, leaving a triangular core behind. (These will seem larger than you expect, but the cake needs these large sizes.) Peeling the apples is optional, depending on how the skin of the variety responds to cooking. Add remaining ¼ cup sugar to butter and cook over a medium-high heat until the sugar begins to caramelise. This should take 2-3 minutes. Add apples, stirring to coat them with the caramel. Cook rounded side down for about 3 minutes, or longer if you leave the skins on. Turn apples over and cook flat side down for about 5 minutes, or until they begin to soften. Space apples out evenly with the flat side down and pour the cake batter over them, spreading evenly. Bake for 30-40 minutes, or until a skewer comes out cleanly. Cool for 10-15 minutes then carefully invert onto serving plate. It should fall out gently. Serve with lightly whipped cream either warm or at room temperature. 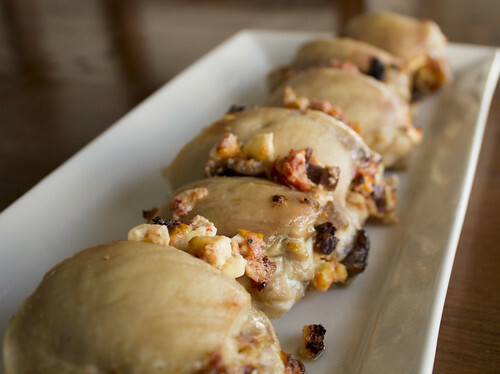 Chicken thighs have a more intense flavour than breasts, and are well suited to this stuffing. Mix the cheese, garlic, parsley and tomatoes and olives together until well blended. Spread the cheese mixture on the boned thighs and roll up, tucking in sides and securing with a toothpick. Brush with olive oil and roast for 45-50 minutes, until chicken is cooked. I served these with Crispy Pan-Fried Gnocchi and steamed broccoli. 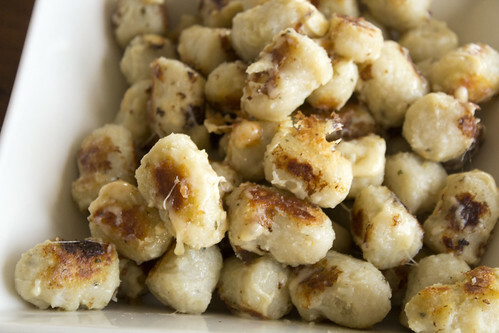 This can be made with any sort of gnocchi: home-made, fresh, or shelf stable. It serves 3-4 as a side dish. Heat olive oil over a low heat, and add the garlic and chilli. Take off the heat and leave to infuse. Cook the gnocchi is a pot of salted boiling water until they start to float. Drain cooked gnocchi. Strain infused oil (step 1 above) and heat. Add drained gnocchi to hot oil and pan fry until golden brown, flipping once. Add strained garlic and chilli to gnocchi. remove from heat and stir through the cheese until cheese is melted.